Every edition of Sheffield’s Doc/Fest is different, but for me this year was particularly special because I came with two hats: my usual i-doc observer one, and my new i-doc director/producer one. 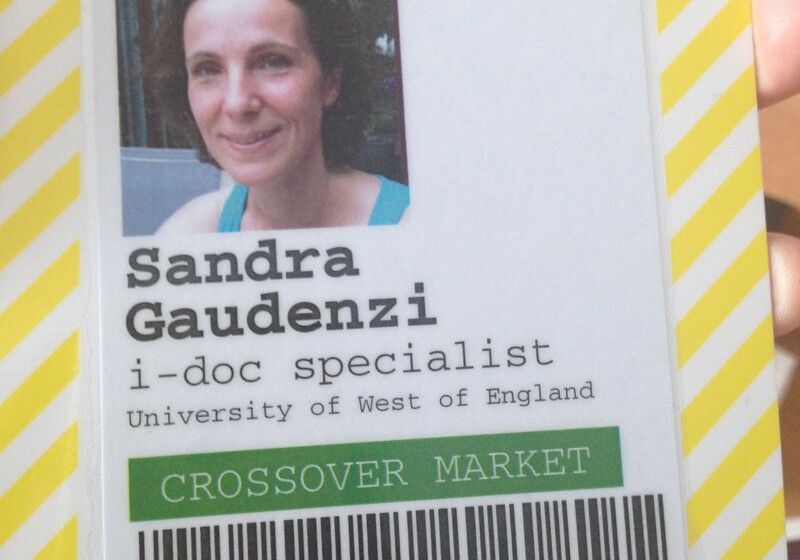 In other words: this year I presented a project to the Crossover Market and got selected. So, together with Mike Robbins from Helios Design Labs and Sarah Arruda, I presented Digital Me, a project in its infancy. This means that for the first time I have seen the other aspect of the festival: the market, the pitches, the schmoozing, the networking, the labor that goes into having visibility and, ultimately, into raising some funding for one’s project. This double positioning has been fascinating and very revealing for me: as always when one enters into the world of practice the first thing that becomes clear is how unclear the process of making is. As we all know, few things are black and white. For example one could have assumed that a market is a place to buy and sell goods – or ideas – while effectively the Crossover Market is more a sophisticated feed-back lab on ideas than a cashing machine (I am speaking of the interactive section). I suppose things are different depending on the quality of your project, and of the stage of production (if you are at an advanced stage of production it is easier to find people interested on it). In an industry with little money to spend people need a solid proof of concept before investing. But since the proof of concept needs itself development money this brings you back in a catch 22 situation: you need money in order to get more money (the good old story). In reality the grades of grey that I discovered in the process of pitching Digital Me are slightly deeper than that: to start with, the cultural context for the pitching environment is very much a documentary one, in the sense that it is story based. 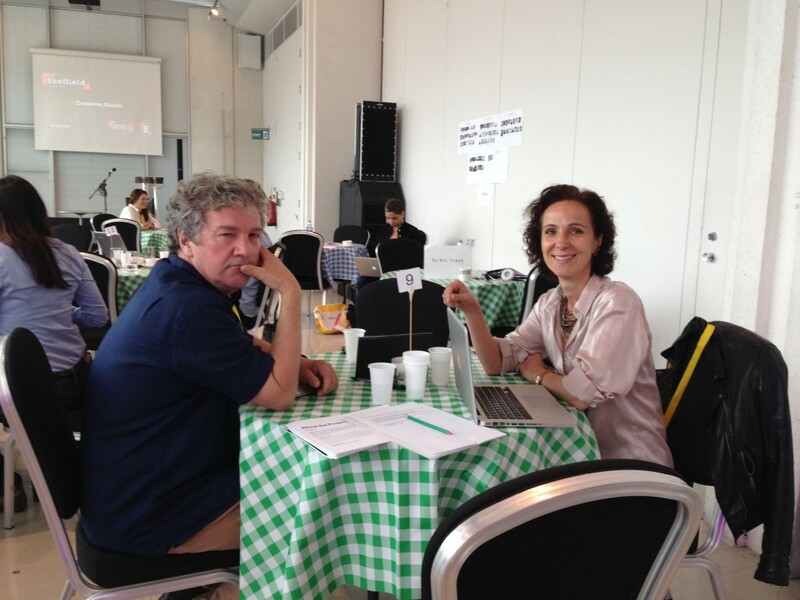 Doc/Fest is a documentary festival, and the Crossover market has to fit in such a context – it speaks a language that TV commissioning editors can understand within a context that feels familiar: you have 20 minutes to present your idea to a “decision maker” and to get his/er feed-back. If you make the maths this means that you have 5 min to do some chit chat, 5 min to present your idea, 5 min to receive the feed-back and 5 min to sum-up what your next steps are (or something like that). You are therefore in an oral environment – where you can show stuff on your computer, but there is little time, quite a lot of confusion around you (there must be 15/20 tables around you where a similar match-making is taking place) and a bell that indicates you that you have just 5 minutes left with your decision maker. The atmosphere is relaxed, but time is short. What you are doing is establishing a first contact and the conditions for a possible follow-up. Then when your time is over, your “decision maker” leaves you to go to another table and you are left with a few seconds to start your sellers speech all again to someone else. I found this pitching ballet an extraordinary process. By the time you have spoken to 4/5 people you notice how you adapt your description of the project to the vibes of the discussion. This happens like in a ballet where you – as a team – intuitively adjust to the gaps on a dance floor. In this ballet I was fortunate to have Mike Robbins and Sarah Arruda at my side: we all intuitively kept the points that seemed to resonate with the previous delegates and tried to adjust the grey areas so that they would appear clearer to our audience and to ourselves. In a way what we were doing was user testing our story. It is a re-iterative process where you keep what seems to work and you change what does not feel right – you are concept testing though the eyes of the commissioning editors. Is this not what I used to do 15 years ago in TV production? This is the point that really made me think: in the TV world, user testing is not really done because, as a producer, once you get the approval from your commissioning editor, you can start to produce. All you need is ONE yes. Of course, once your documentary will be broadcasted there will be a moment of reality check – but if your audience ratings are bad you can always blame the time slot of transmission or claim that it was more of an art movie. But in interactive production are we not supposed to test our ideas with our final users rather than with our financers? Is the proof of concept not in the very fact that you can proof that people will be interested in your project? This brings me to my second realization: concept testing with users is not easy if you come from the world of TV production. This came a little as a shock to me… as I am a fierce advocate of agile design in interactive storytelling. If you had a look to the interviews that I recently did for my UX Series, you will know that I have spent a good part of this year researching possible links between design iterative methodologies and i-doc production. If you were to ask me to mentor your project the first thing I would say to you is: test your concept with your target audience. But, interestingly enough, now that I have temporarily exchanged hats – from academic to director – I am realizing how this might be more difficult that I had expected. Let’s be more precise: for someone like me that has learned the trade 20 years ago in linear TV production, a certain pattern is engraved in my mind. Somehow, engraved in my own culture of production, is the idea that I am responsible for my idea. My job, as a director, is to know what I am doing, and to have a good, solid story. How compatible is this with the iterative methodology of design? How compatible is it with a Crossover Market that is itself structured as a TV market? Could I realistically come to Crossover Market and pitch an idea, with just some first code sketches (not the final look and feel) and say that I do not have the answer to most questions because I will keep re-iterating my concept as I go along? Would this design position not be totally suicidal in this market environment? Or maybe is just me that was trapped by my own know-how of TV production and behaved accordingly to what I have learned in the past? How long does it take to think and act differently? The other way to see this point is to question if interactive markets could, or should, be structured differently? Should we have new methodologies of persuasion in an interactive environment? How much are we all victims of our own professional contexts, and therefore reiterating the old rather than inventing the new? As I write these lines I want to make clear that I do not have the answers myself. These are questions that came to mind as I felt somehow “lost in translation” or maybe “in between two cultures”. This is not at all a criticism to the amazing tour de force that Charlie Philips and Anna Parker have managed to do with this Crossover Market: these guys have been uber efficient, always responsive to my e-mails (at any time of day or night) and totally open to suggestions… Not to mention the professionalism, the availability and generosity of ideas of the decision makers: all of them gave us great feed-back, and this is invaluable as such. But what I am talking about here is not a problem of efficiency, but rather a shift in professional culture and know-hows. Maybe interactive pitches could benefit from being placed outside of documentary festivals? Maybe the so-called “decision makers” (a terminology that made me laugh because it clearly indicated that few of them were there to effectively commission stuff) should come more from the digital world? Maybe this would re-balance the discussion and bring the story and its interactive realization at the same level? In the same way that multi-disciplinary teams must learn to work together to produce compelling i-docs that looks less like “films with extra clicks” and more like “digital entities”, I am wondering if a market for interactive narrative should not include more coders, designers and creative technologists that think, breath and speak in a non-linear world. I definitively do not have the answers yet, but this seems like an urgent question to me. If you are working in the field, and have something to add to this, I’d love to hear from you.